Games provide not only fun but serious learning in a captivating manner even if commercially available relevant games are used (Bokyeong et al. 2009). They enable the players to become decision makers, experimenting with different ways of thinking, experiencing the subject domain in different ways, creating a platform and capability of future learning and problem solving (Gee 2003). Board games are an important tool to provide hands-on and heads-on skill and knowledge development for people of all ages on all subjects in fact. Not only do well-designed games create an engaging atmosphere, they also provide a nonthreatening, playful, yet competitive environment in which to focus on content and reinforce and apply learning. The board itself provides a visual metaphor to help connect information. Effective games serve to organize information in a conceptual framework and to make it concrete. A growing body of research proves that properly designed team-based board games not only inspire learning, they encourage communication, collaboration and risk taking. They empower players by helping to build self-confidence. The different elements of game design support a wide range of player abilities, and learning translates to behaviour changes . Not only do games motivate students/players in a fun way offering interactive competitive learning environments, they also provide many other positive features. Games lighten the mood and this facilitates greater creativity and boost student morale and interest (Shatz & Loschiavo, 2005). Wycoff and Pryor (2003) say that a lightened mood can negate communication apprehension. 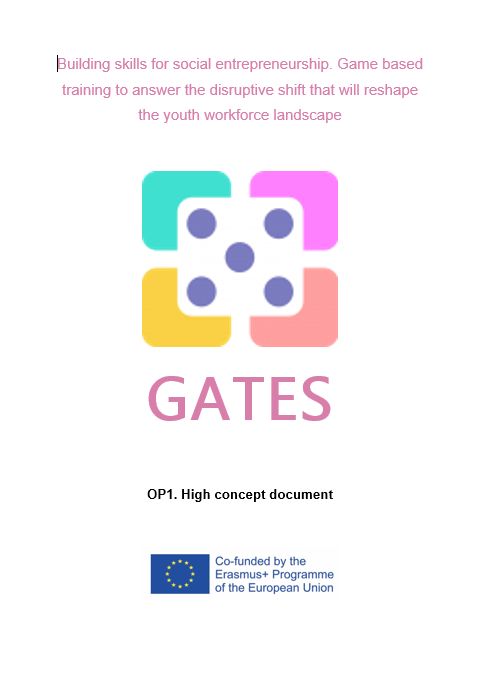 This document contains the first component of the intellectual output of the GATES Project. Under the name of High concept document, this text contains the basic elements that will form the main result of this initiative. The document has been developed following a path that we began in the objectives of the project, and we go through it stopping at important aspects such as social entrepreneurship (which shows us the different elements that compose and determine it), the emerging technical, social and/or interpersonal skills that are key to undertake socially (and their interrelations) and the pedagogical approach to use within our training tool. And thus reach our first goal of the GATES project: Conceptual map of the project. GATES board game, will develop two different types of competences, addressed while playing and learning how to set and manage a social enterprise. Transdisciplinary: literacy in and ability to understand concepts across multiple disciples. Sense making: ability to determine the deeper meaning or significance of what is being expressed.